Arguably the most well known of the traditional building techniques and extremely prevalent throughout East Anglia – the ancient craft of building a roof using natural materials – is a time honoured skill that remains fully in operation on a daily basis for the Emmerson Critchley team, which includes second generation Master Thatchers. 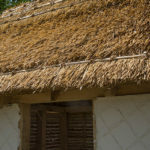 Throughout the centuries and continuing today, local natural resources inspire the finish so straw thatch is prevalent inland and reeds are utilised in coastal areas. Either way, these traditional, low carbon footprint materials offer beautiful results utterly in keeping with the local surroundings. Whether it’s a full re-thatch (to a period property, new build, porch or extension), thatch restoration, emergency repairs, on-going maintenance, re-ridging, the creation or renovation of ridge thatch patterns, or fireproofing, the Emmerson Critchley team can help. In addition, the Emmerson Critchley joinery specialists can also undertake any related woodwork including rafter replacement or the installation of fireboards, for example. Rest assured that you will receive a comprehensive, cohesive and well managed service.